Point à la ligne: Obesity In Lebanon: The Shocking Truth! The problem of obesity is “not a simple and discrete” one, just like Michelle Obama once stated. There is no specific cause but many. And the consequences are bigger than a single individual would imagine. As dietitians, we try to solve this epidemic one person at a time. However, we will need hundreds of years to do so! Researchers and community nutritionists try to attack a mass of people so that the hundreds of years would become decades. And that’s exactly what the team at AUB, USJ and USEK tried to prepare for in the last 2 years. 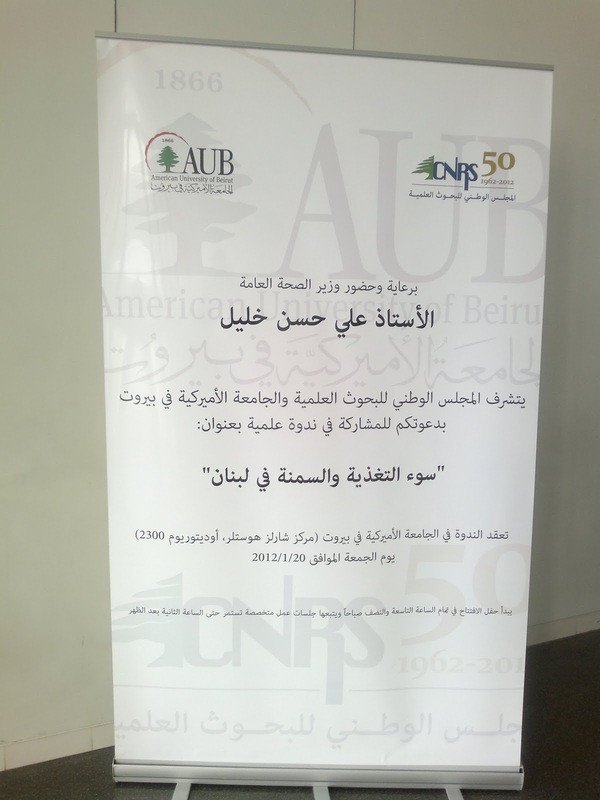 Along with the ARU (Associate Research Unit) and the CNRS (National Council for Scientific Research), they conducted a study that would include representative samples of Lebanon. 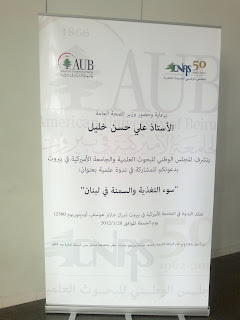 Lots of interesting and probably also shocking results were exposed by the team in a seminar entitled “Undernutrition and Obesity in Lebanon” on Friday, January 20th 2012 at the AUB campus, under the patronage of the Minister of Health, Ali Hassan Khalil. The study included around 3500 people from all over the country. The male/female ratio was chosen according to the area and was representative of this area. Thankfully, the rates of underweight in our country were very minimal. That problem is crossed off the list! However, they discovered that 1 in 3 children or adolescents were either overweight or obese. 36% of adults were overweight and 26% were obese. In comparison with results from 1997, this study showed an increase of childhood obesity of 1.6; a doubled adolescent obesity and an increase of adult obesity of 1.5. 7.1% of males and 31.6% of females were deficient in Vitamin D.
25% of the population was deficient in Zinc. 21.7% of the population lacked Selenium. More research showed that almost 100% of the population had inadequate intake of Vitamin D.
These results are quite disturbing. There was a need to find out why and how we can change that. Ok! So we have an obesity problem. But where does it come from? The precipitating factors of obesity and overweight were different for children and adults. While some people may think Lebanese food is very high in fat and could induce obesity, it turned out to be very protective. The only pattern that was proven to be very fattening was the western one. Based on those findings, this team of professionals decided to put an action plan to try to reduce the obesity and overweight rate. They created Food Based Dietary Guidelines (FBDG) for adults. For children, they started an intervention in schools, public ones, to create awareness for healthy eating. The FBDG are still a draft to be reviewed by several ministries such as the Ministry of health before being exposed to the public. We will mention a few such as more fruits and vegetables, more legumes and cereals, less saturated fat, less alcohol, more physical activity, etc. They are very well adapted to the Lebanese cuisine and tradition. i heard the guidelines were created by aub not the whole aru and what r the guidlnes we can buy them? Obesity has been an issue ever since. That’s why I always find time to consult a registered dietician long island to help me watch my health. The funny part is that obesity is really easy to combat. Some exercise, a healthy diet, and maybe herbalife australia products would be enough to get the job done - if only there was enough personal effort to go with it. This is not only in Lebanon but also to other countries as well. I wonder if our race contributes to this problem because as we can see, majority of Asian people are petite. Not just in Lebanon, obesity is rampant because of sedentary lifestyle. I can also foresee that the numbers will just shoot up until they find a healthier substitute to fast foods. Who would've thought that in a country that is in Middle East, people are suffering from being obese. Staying away from foods that can cause obesity is one of the things we can do aside from engaging ourselves to strenuous activities such as exercises. So obesity is not a problem reserved only for the well off western countries. Maybe it is the nutrition that people have and the food that they take in which causes this. I'm pretty surprised that "educated mothers" would be such a factor in inducing obesity in girls. I'd expect them to be the first block against over-eating for children, since they've learned about it already. Well I think it could be because educated mothers are working ones and they don't have time to cook every day and watch their children's nutrition... And that's where fast food plays a huge role therefore obesity!